The first bit of the Trans Pennine Trail spur in this part of the world was followed by a group of five across Tapton Golf Course on a repeat of the short ‘Stephenson Trail’ of October last year. 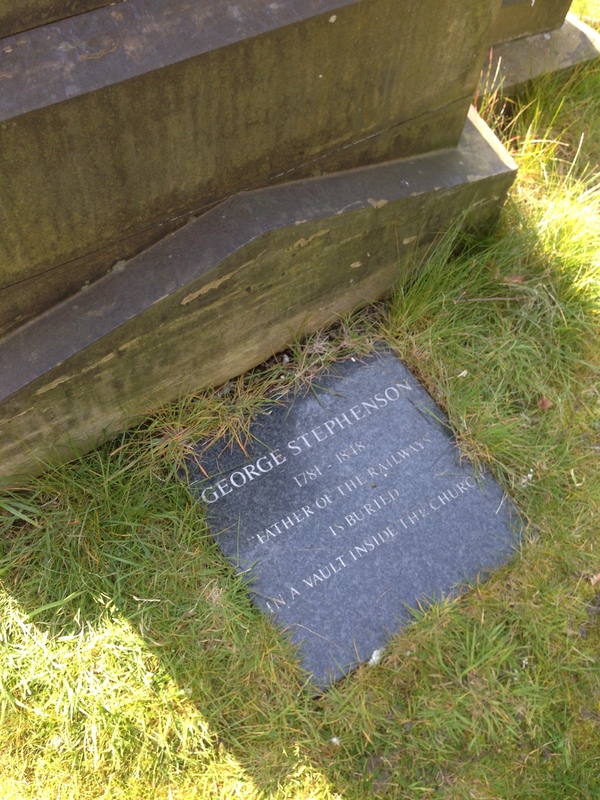 The ‘father of the railways’, George Stephenson spent the last ten years of his life at Tapton House and is buried inside Holy Trinity Church – with a namesake having pride of place outside the church entrance. via Bolsover Castle, New Bolsover, Carr Vale Nature Reserve, Sutton Scarsdale Hall, and part of the Brimington West Wood. Leaving Bolsover in bright spring sunshine, nine members followed a route along the Bolsover to Glapwell ridge and took a coffee break at Glapwell Garden Centre. After a short session of admiring the many plants and flowers on view the group commenced the return journey via Stony Houghton and Scarcliffe. Nineteen left Edale to climb the rugged Crowden Clough – some attacking the scramble head on – and onto the Kinder plateau, with a welcome coffee stop at Crowden Tower. Sunshine and lovely views all day for the circuit above Jacob’s Ladder, via Kinder Low, Kinder Low End, Brown Knoll and Lords Seat. Fields, lambs, and spring flowers to end the nearly 12 mile walk. A bright day for an eight mile circular from the Three Lakes Country Park near Shirebrook. After passing the Sports Direct complex at Shirebrook it was a journey through Pleasley Park to the mills in Pleasley Vale and a stop for lunch on the Derbyshire / Nottinghamshire border in front of St. Chad’s Church. Originally built on the Derbyshire side of the River Meden the church was apparently taken down and rebuilt on the Nottinghamshire side of the river, following a bizarre wedding disagreement. 27 walkers in our group today. A four mile morning circular from Chesterfield Rail Station to the Royal Hospital at Calow, using a Transition Chesterfield devised route – and adding an exploration led by Joe of the Victorian Public Cemetery at Spital, the second oldest in the county – and near to the site of the old leper hospital. Contrary to the weather forecast, a glorious spring day for a train / bus walk from Kegworth in Leicestershire to Clifton on the edge of Nottingham. Strangely turning to snow and hail as the group of ten returned to Chesterfield Rail Station. 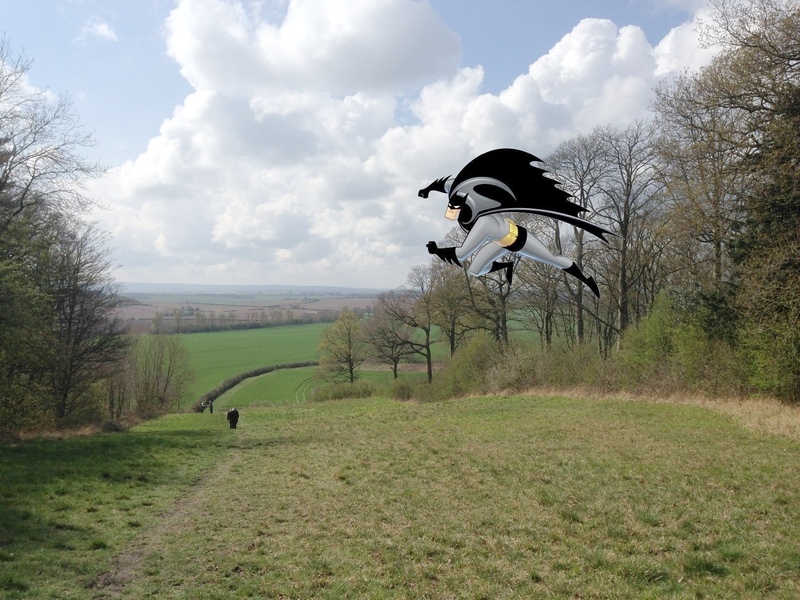 The route from Kegworth was via the Midshires Way and the West Leake Hills to a lunch spot above ‘Gotham City’ by the Cuckoo Bush Tumulus. The history of Gotham and its future link with New York City dates back to the time of King John. In the absence of a county council to maintain the ‘King’s Highway’ the ‘wise men’ of Gotham feigned madness, regarded as infectious at the time, to avoid having to build a road to facilitate the King’s journey to Nottingham. The American writer Washington Irving perceived some link between the people of Gotham and those of New York City and this eventually led on to an unofficial name for the City and the Batman saga. The afternoon saw the onwards journey to catch the Clifton Skylink back to East Midlands Airport, via the site of the old Thrumpton Ferry across the Trent, and Barton in Fabis. 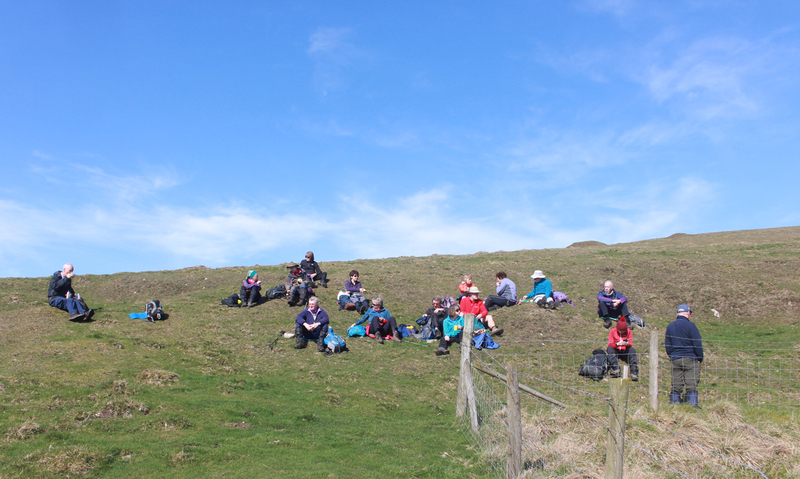 Starting from the Three Roofs Cafe in Castleton, nine members set out in glorious spring sunshine to follow a route taking in the bottom of Winnats Pass, Treak Cliff, Odin Mine, Back Tor and Hope. One slightly strenuous climb was rewarded with nothing less than spectacular views along the Hope Valley. The Valley floor, now covered in the fresh green of new grass, made the limestone walls and dark hedgerows stand out in the bright spring sunshine. 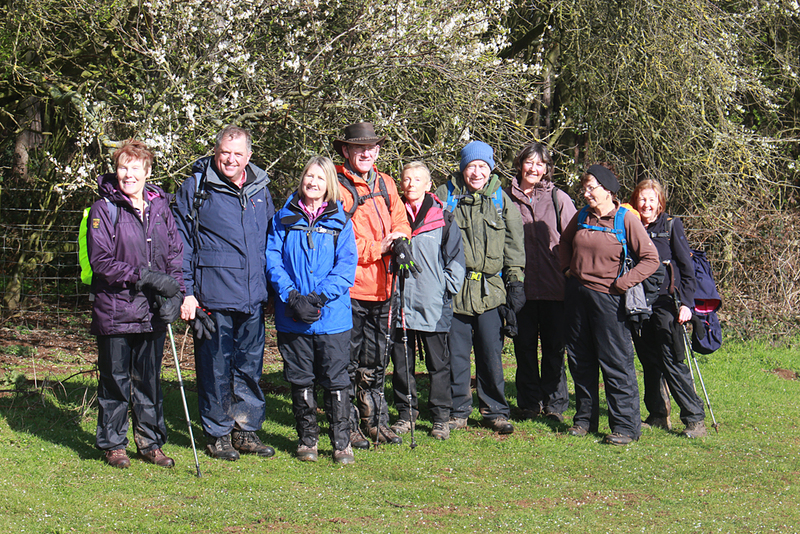 A gorgeous spring morning for a leisurely four mile circular from Grassmoor Country Park to the Avenue Washlands Nature Reserve, with guests from Sheffield, Belper, and the Friends of Grassmoor Country Park. The Washlands provided a chance encounter with another of our group, pursuing ornithological interests today. 21 walkers took the bus to Morton for a five mile linear walk to Pilsley Church. The route first took us into Doe Hill Country Park where we were able to look at an information board which explained how this park had been transformed from a coal mining pit into an attractive place to walk. The Silverhill Trail took us to Tibshelf Ponds where lunch was taken. About another two miles on the Five Pits Trail took us to Pilsley and the bus home. A cool, cloudy but dry day. A group of 17 set off from Fairholmes to complete a circuit taking in Lost Lad, Back Tor, Cartledge Stones Ridge and Abbey Brook. Although it was mainly cloudy until the afternoon when the sun managed to break through, we enjoyed good views across the Derwent Valley towards the Great Ridge, and across the moors towards Bleaklow, Emley Mast and Castle Hill (Huddersfield). After a lunch break sheltered by a rocky outcrop, we took an initially narrow path descending the clough at the head of Abbey Brook. Crossing Abbey Brook at Sheepfold Clough we took a broader track which led downhill to the reservoir and so back to Fairholmes – 11 miles in all. Eight of us set out from Elsecar Heritage Centre for a nine mile walk around a surprisingly attractive part of South Yorkshire. Our route took us through woods and over fields to Wentworth. Here we looked at the old and new churches, walked through the village past the appropriately named Paradise Square, then up by the windmill and into the grounds of the extensive Fitzwilliam Wentworth Estate. The tell tale green doors of the estate property were seen throughout the walk . 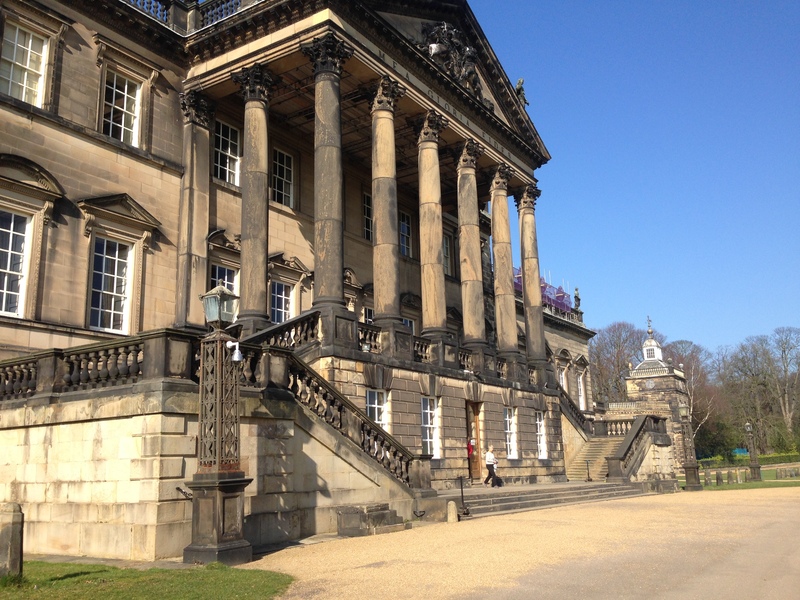 We went to see the magnificent mansion of Wentworth Woodhouse, with the longest frontage of any in Europe. It was a particular joy for me to be able to lead the group right past the front door, as the mansion has passed from private ownership into the care of the Preservation Trust. What a task they have taken on to safeguard and then restore this magnificent, but crumbling property ! We continued along the ridge path, with extensive views over to the Peak District hills before descending back to Elsecar. A lovely bright sunny day for our walk. Another leisurely morning walk of just four miles, a circular from Morrison’s on Chatsworth Road along the Hipper and via Walton Dam, Somersall, Holymoorside, and Old Brampton. 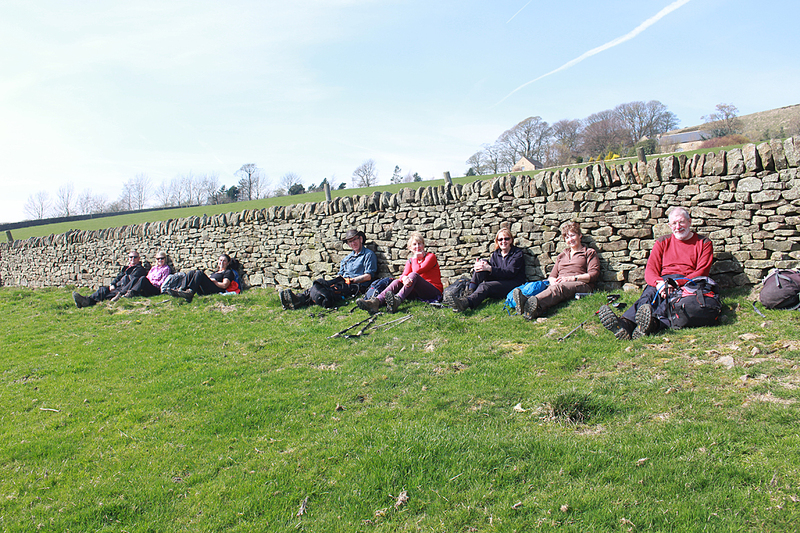 Ten walkers, including four from Sheffield, enjoyed dry conditions. 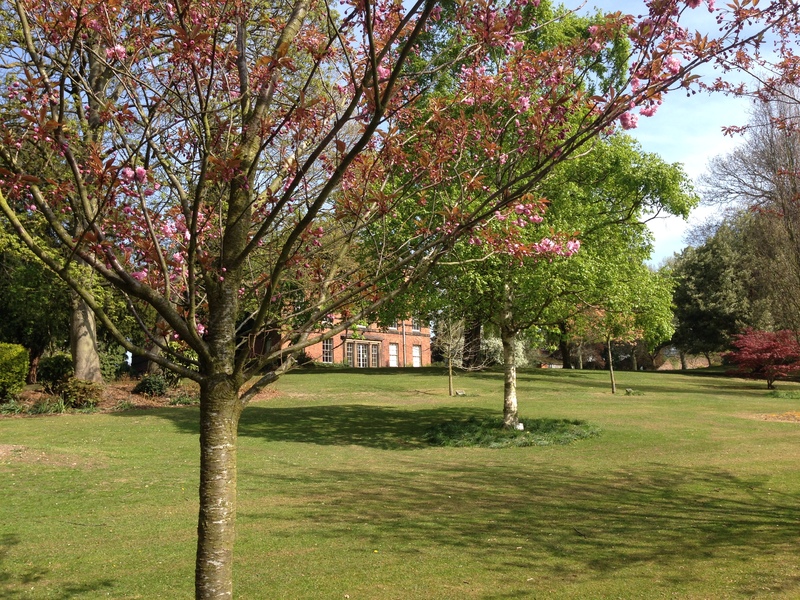 Whirlowbrook Hall, on the outskirts of Sheffield, is a popular place for weddings – and the starting point of quite a few of our walks. 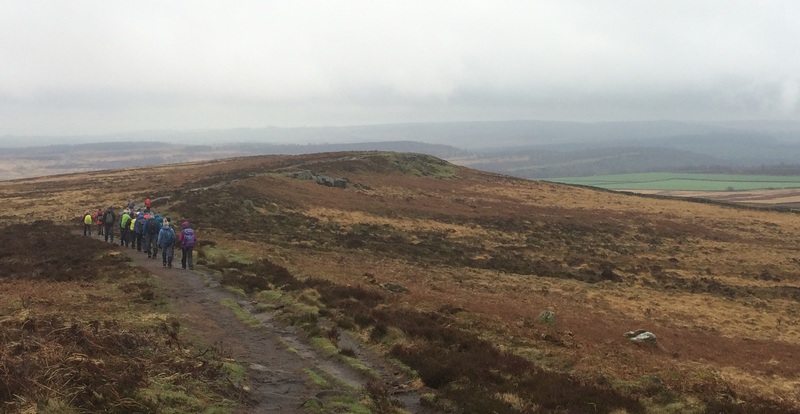 An 11 mile circuit for seven walkers (five members and two guests) on a damp and cold day. What a difference a week makes. Back to traditional March weather for a walk along White, Baslow, and Gardom Edges from the Grouse Inn. A group of ten ‘long bus’ walkers set off from the ‘Young Vanish Inn’ in Glapwell for a ten mile walk in breezy showers around Hardwick. From Glapwell we walked via Rowthorne to the site of Pleasley Pit to join the Skegby Trail and then on to Teversal and Silverhill. 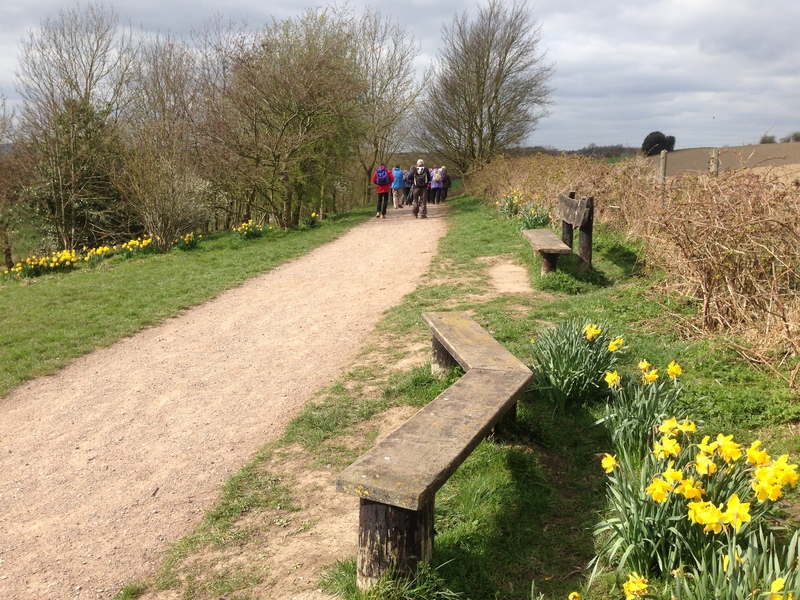 The walk continued across to Hardwick via the village of Stanley to enjoy lunch in the shelter of the Park Centre before climbing to Ault Hucknall, Bramley Vale and Doe Lea for the bus back to Chesterfield.